It’s that easy to save on your Easter hotel this year. Just make sure you book by April 21, 2019. Here, take a peep. 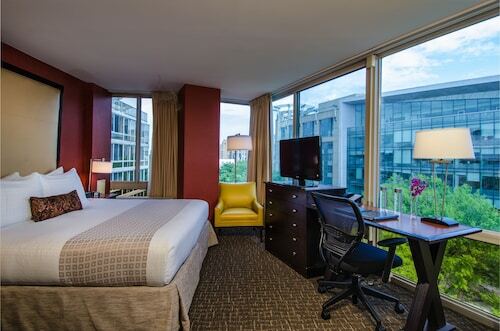 This family-friendly hotel is located in the city center, within 1 mi (2 km) of Georgetown Waterfront Park, Kennedy Center, and George Washington University. Georgetown University and George Washington University Hospital are also within 1 mi (2 km). Foggy Bottom Station is 18 minutes by foot and Farragut North Station is 26 minutes. 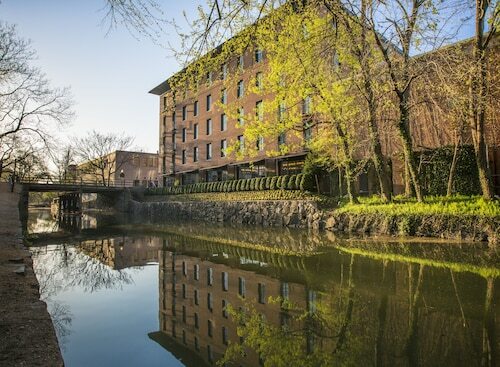 The Kimpton Glover Park is short distance away from the heart of Georgetown, where guests can explore the C&O Canal, Georgetown's cobblestone streets, and shopping and dining. 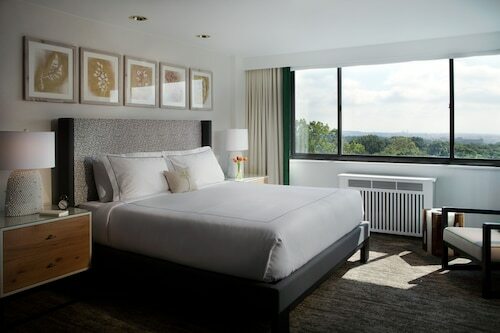 The hotel is just steps away from Georgetown University campus, local art galleries and eateries, upscale boutiques, and the Kennedy Center for the Performing Arts. The Washington Harbour offers scenic boardwalks, Potomac River boat tours, and a variety of restaurants. National Cathedral in Neo-Gothic style – the sixth largest in the world – is only a short walk away and features gardens, exhibits, and evening choral performances. 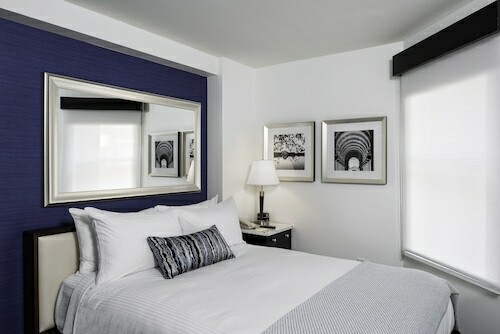 Club Quarters is in a prime location in the center of the business district, and two blocks from the White House and key government buildings. A short walk to Lafayette Square and the monuments and museums, including the Smithsonian. Minutes from Georgetown. 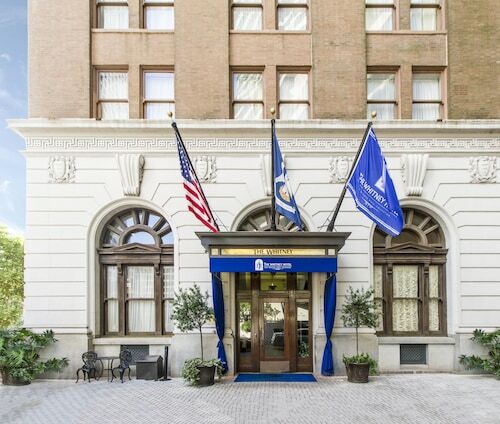 Ideally located on Thomas Circle, near Massachusetts Avenue in the heart of Washington DC, this Kennedy-era hotel is 0.3 miles from MCPherson Square Metro Station and 0.7 miles from the Smithsonian Museums. The White House is 6 blocks from the hotel. 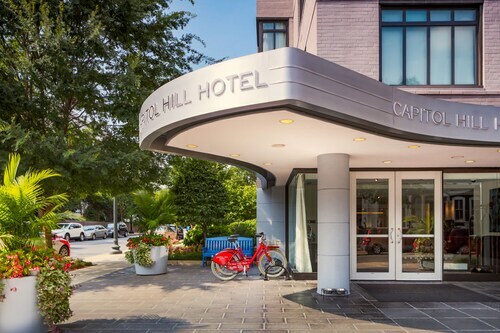 Located in the vibrant Dupont Circle neighborhood, this stylish hotel is 5 blocks from modern art at the Phillips Collection and 8 blocks from the National Mall's museums. 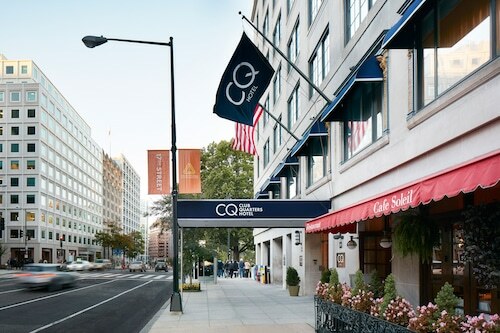 Just west of downtown, this upscale hotel is 2 blocks from the Foggy Bottom Metro station, Georgetown, and George Washington University and Hospital; the White House is 8 blocks away. 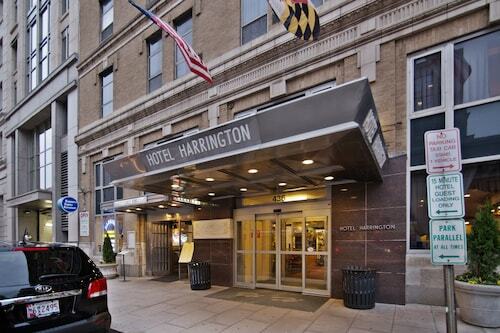 This Washington, DC hotel is within 3 blocks of Union Station, the Capitol, and Senate offices, and 4 blocks from the Judiciary Square courthouse complex and the National Mall. 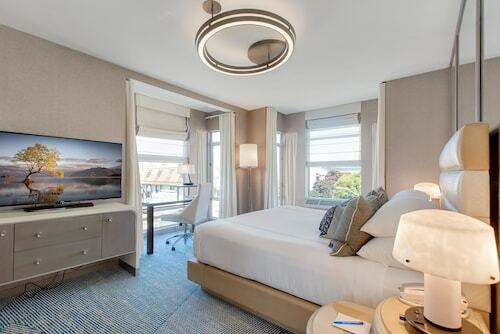 Situated within walking distance to the National Mall, Embassy Row and boutique-filled Georgetown, the luxurious St. Gregory Hotel is a true gem among Washington, D.C. hotels. 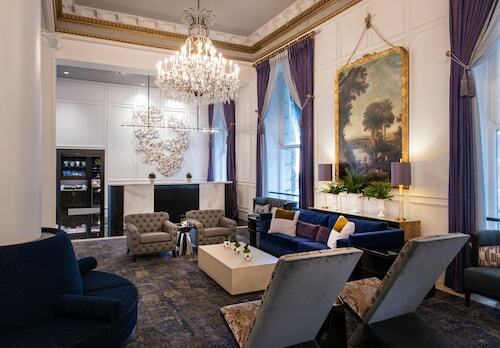 This luxury hotel is located in the fashionable West End, two blocks from K Street at the footsteps of Georgetown, and less than a mile from the White House and the Smithsonian. 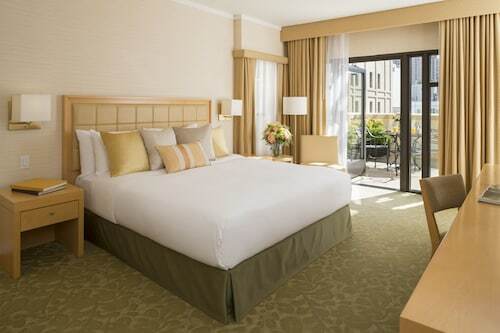 Overlooking Dupont Circle in one of Washington's most desirable neighborhoods, this hotel is about 1 block from Embassy Row and 7 blocks from the White House. 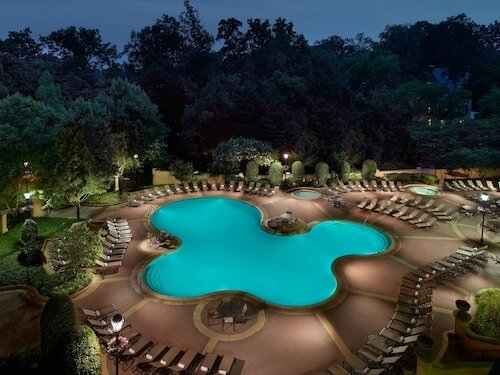 Overlooking Rock Creek Park, Omni Shoreham Hotel is a 10-minute walk from the National Zoo and 4 minutes from Woodley Park-Zoo Metro Station. From there it's a 12-minute ride to Pennsylvania Avenue, where guests can tour the city's famous monuments, from the White House to the Lincoln Memorial. 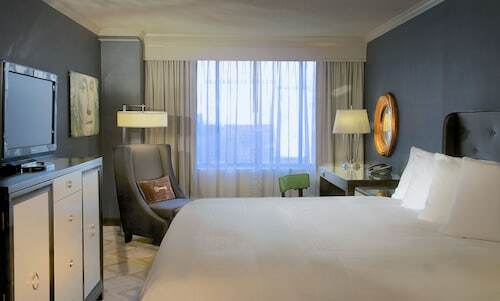 This Westin hotel is conveniently located 6 blocks from The White House, 6 blocks from the Convention Center, 10 blocks to the Smithsonian museums, and in close proximity to 2 Metro stations. 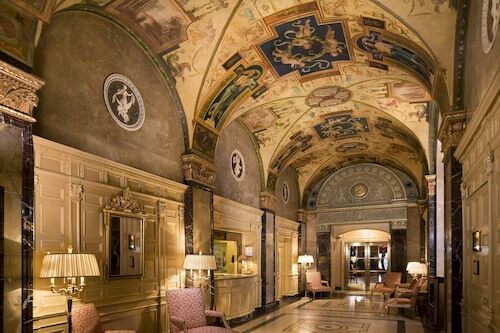 Once a luxury apartment building, this historic hotel in the Washington, DC's Dupont Circle neighborhood is within walking distance of restaurants, cafés, boutiques, art galleries, and two DC Metro/Subway stops, Dupont Circle and Woodley Park-Zoo. The River Inn sits on a brick-paved street lined with mature myrtle trees in historic Foggy Bottom, 4 blocks from the Kennedy Center for the Performing Arts and 5 blocks from Georgetown. Located 4 blocks from Dupont Circle, the 9-story Beacon Hotel is a 0.5 miles (0.8 kilometers) from the new Washington Convention Center. Who's to say you're not a visiting diplomat or Georgetown scholar-in-residence at this conveniently located, spacious hotel? 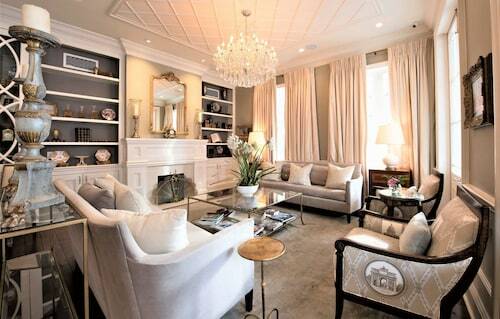 Guest suites have full kitchens for those oh-so-important DC dinner parties. 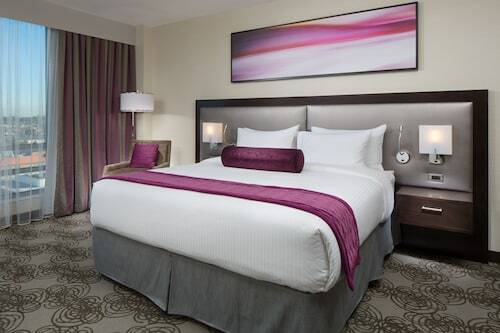 Conveniently located in downtown Washington, DC, this hotel is a few blocks from the U.S. Capitol, the National Mall monuments, the Smithsonian, and the Arena Stage. Ten minute walk to The Wharf and within walking distance to over 30 new restaurants. 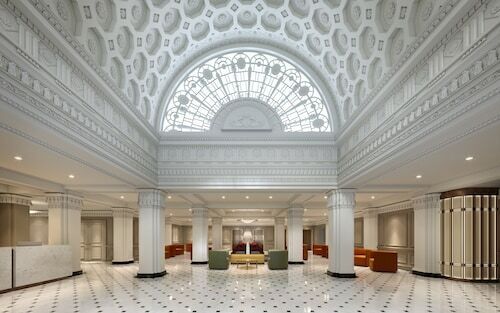 In the pulse of everything political and historical in DC, this hotel is 1 block from the Metro, shops, and restaurants of Union Station; the Capitol is 2 blocks away; major landmarks are within 3 miles. 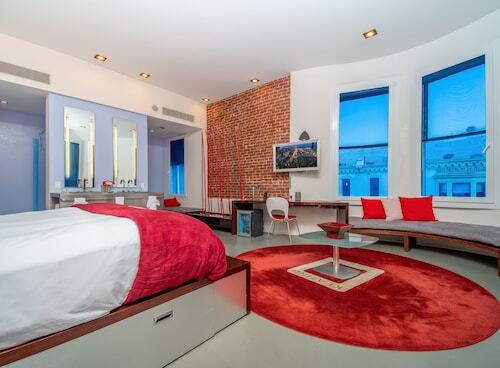 This all-suites hotel is two blocks from the Library of Congress, the Supreme Court, and the Capitol, and within two miles of the National Mall's museums and monuments. 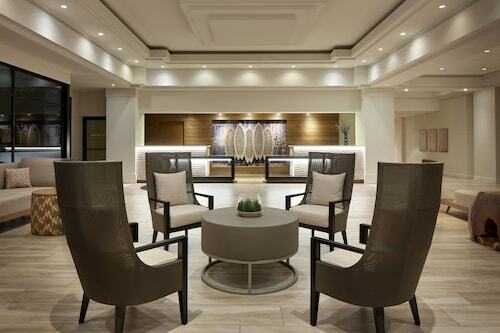 Set in the posh Chevy Chase Pavilion shopping complex, just steps from the subway station, this uptown Washington, DC, hotel is within 6 miles of the downtown core, the White House, and the Pentagon. Located in Downtown Washington D.C., this hotel is within a 10-minute walk of Ford's Theater and Capital One Arena. Smithsonian Institution and White House are also within 15 minutes. Center Station and Federal Triangle Station are within a 5-minute walk. 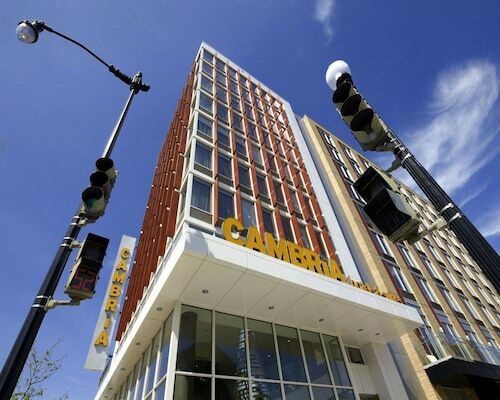 This DC hotel is located within Georgetown University's student center, at the north end of campus. M Street shops and restaurants are 1 mile from the hotel; the White House is 2.7 miles away. The hotel provides a free 10-minute shuttle service to Union Station, a transportation hub that also features a variety of shops and restaurants. The Smithsonian is 3 miles (4.8 km) away, and the historic Georgetown neighborhood is within 5 miles (8 km). 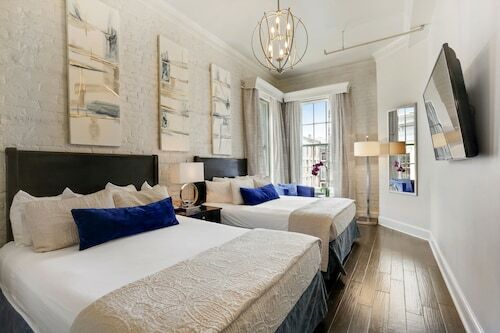 This Foggy Bottom boutique hotel is surrounded by 19th-century townhomes, a half-mile from Georgetown and two blocks from George Washington University. 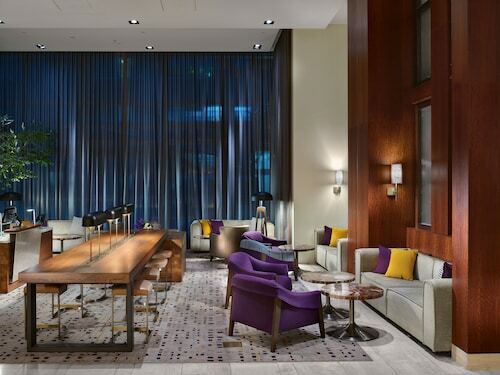 Located in Downtown Washington D.C., this hotel is within 1 mi (2 km) of Walter E. Washington Convention Center and Capital One Arena. White House and Smithsonian Institution are also within 2 mi (3 km). 7th St. Convention Center Station is 5 minutes by foot and Shaw Station is 8 minutes. 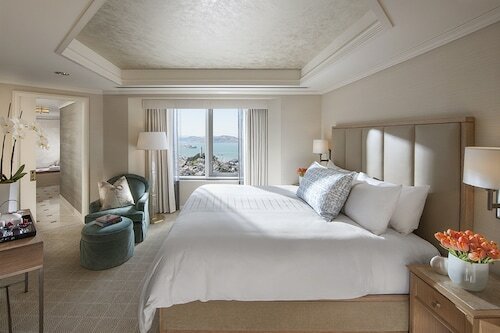 Fairmont San Francisco is located atop swanky Nob Hill, the only spot in the city where every cable car line intersects. Guests can hop a ride past the Cable Car Museum to Pier 39 and Fisherman’s Wharf, or walk 4 minutes to Chinatown. Union Square is just a half-mile away. 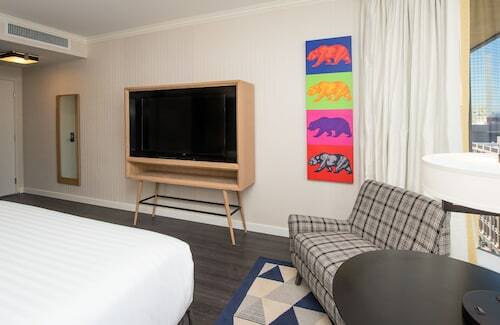 This family-friendly San Francisco hotel is located in the historical district, within a 5-minute walk of Ghirardelli Square and Van Ness Avenue. San Francisco Bay and Aquatic Park are also within 10 minutes. 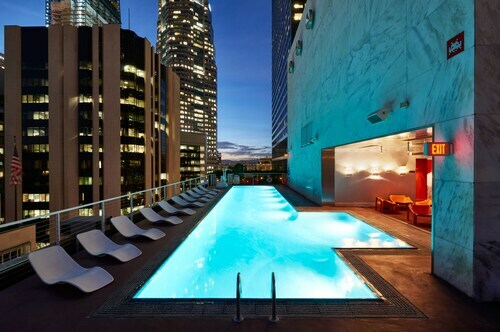 Offering spectacular views, this luxury hotel occupies the top floors of a 48-story tower in San Francisco's Financial District, 4 blocks from the Transamerica Pyramid and 6 blocks from Union Square. Set at the top of San Francisco's prestigious Nob Hill neighborhood with a cable-car stop out front, The Huntington Hotel is within 6 blocks of Union Square, the financial district, and Chinatown. 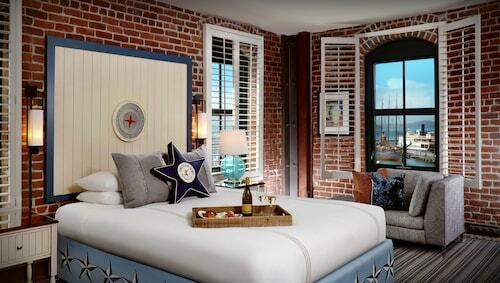 Across the street from San Francisco Bay, this boutique hotel occupies a creatively converted 1909 brick warehouse; fun-filled Fisherman's Wharf is right outside; the Alcatraz ferry is 6 blocks away. 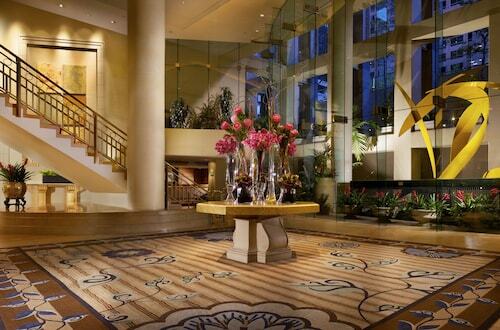 Located at the base of Nob Hill, Omni San Francisco Hotel is a 13-minute walk from Union Square. 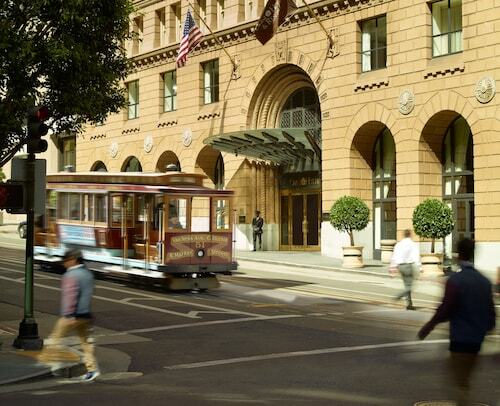 The Embarcadero Center, BART Station, and North Beach are within a 7-minute walk, and guests can hop the California Street cable car as it travels right past the lobby. 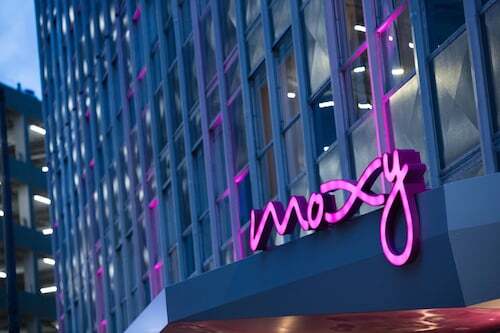 Opened in 2008, this downtown San Francisco hotel is adjacent to the Moscone Center and about 6 blocks from Union Square. This 1928 hotel is a half-block from San Francisco's Union Square, 3 blocks from the theater district, and a half-mile from the Financial District and Moscone Center. 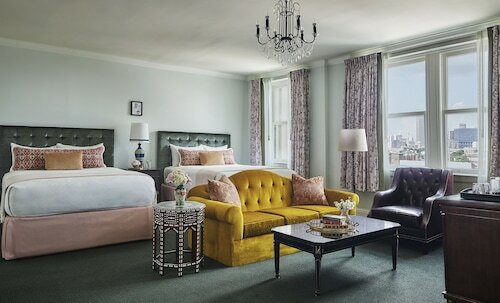 The updated 1928 San Francisco hotel is blocks from Union Square and the Tenderloin which are set in the heart of the Downtown district. This area is a hub for artists, galleries restaurants, bars, cafes, and an influx of new development and activity.The Tilden is walking distance of some of San Francisco's other exciting neighborhoods, including Nob Hill, Russian Hill, SoMa, and Hayes Valley. Infused with the spirit of Italy, this romantic downtown San Francisco retreat is on the Powell Street cable car line, less than a block from Union Square; theaters and Market Street are two blocks away. Orchard Garden Hotel is right next to San Francisco's Chinatown Gate, about a block from the Financial District, and 2 blocks from Union Square's world-class shopping. 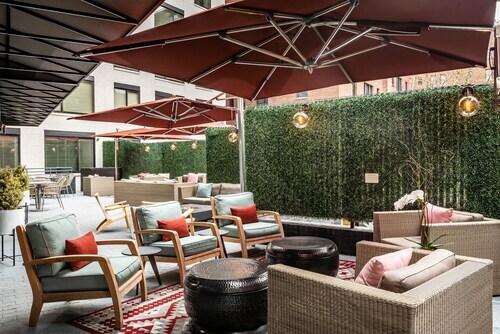 Blithely original, the boutique-style Hotel Triton is located across from Chinatown's Dragon Gate, 2 blocks from San Francisco's Union Square and financial district, and 6 blocks from Nob Hill. Located in the heart of San Francisco and just blocks from Union Square, the Hotel Kabuiki anchors the Japan Center, a complex of Asian boutiques, Japanese restaurants, sushi bars, and gardens. 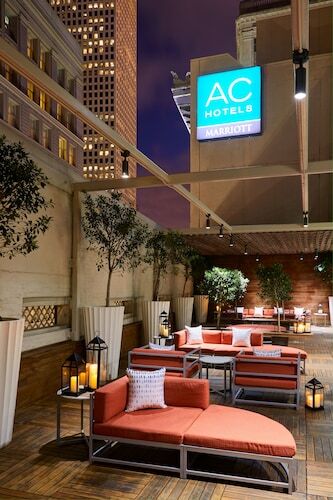 This downtown San Francisco hotel is surrounded by shopping, restaurants and theaters, only 2 blocks from Union Square, and just a few blocks from Moscone Convention Center, Chinatown and the Embarcadero. 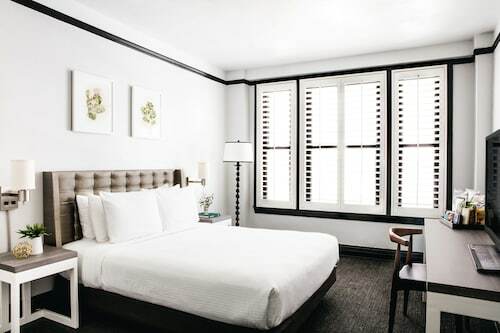 This smoke-free, boutique hotel is conveniently located in the arts district where Nob Hill meets Union Square, and it is just a few blocks from both the Financial District and Moscone Center. 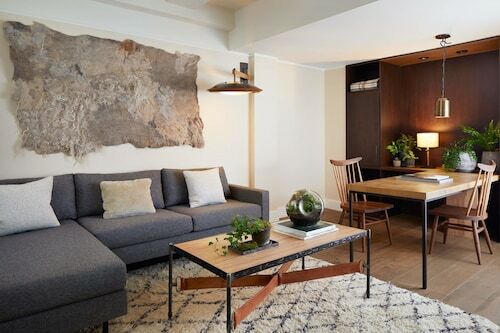 This hotel is one block from shopping at Union Square, theaters, and historic cable cars, and less than a mile from San Francisco's MOMA, Financial District, and Moscone Center. Eclectically decorated The Marker San Francisco, a 1910 Beaux Arts building, is within 2 blocks of Union Square and the Curran and ACT theaters. Moscone Convention Center is within a few blocks of the hotel. Favored by businesspeople, the Orchard is a discreet downtown San Francisco hideaway, located on the Powell Street cable car line below Nob Hill, 2 blocks from Union Square. 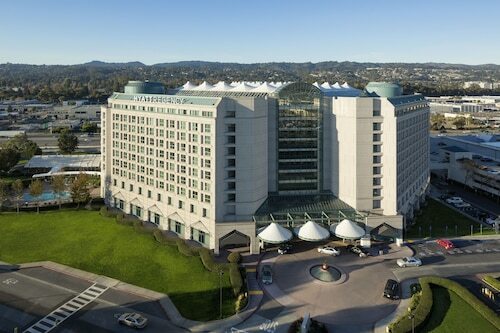 Guests can hop a cable car right outside this hotel; stroll 2 blocks for fun on Fisherman's Wharf; explore the delights of Ghirardelli Square, 3 blocks away; and walk 5 blocks to the Alcatraz ferry. Located in Downtown San Francisco, this historic hotel is within a 10-minute walk of SHN Curran Theatre, Golden Gate Theatre, and Powell and Market Cable Car Turnaround. Warfield Theater and Westfield San Francisco Centre are also within 10 minutes. Powell St. Station is 7 minutes by foot and Montgomery St. Station is 11 minutes. This San Francisco hotel sits atop Nob Hill, next to 3 cable car lines; Chinatown is 3 blocks away, and Union Square is 5 blocks away. Chinatown is 5 minutes on foot, and the American Conservatory Theater, winner of a Regional Theater Tony Award, is 6 blocks away. There is a cable car station steps across the street. Club Quarters Hotel in San Francisco is located in the center of the financial district, across from the Embarcadero Center. It is a short walk to Market Street, Chinatown, the Ferry Building, Union Square, and North Beach. Convenient to the cable car system, it is a short ride to Fisherman’s Wharf. 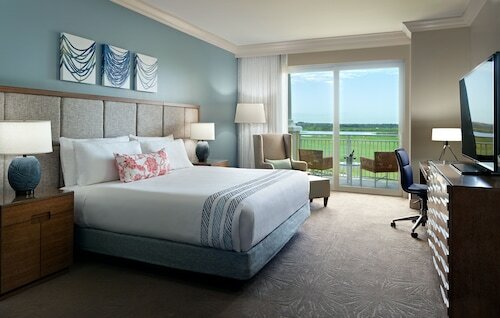 Set along a tranquil lagoon, this contemporary resort-style hotel is 11 miles south of San Francisco International Airport and an equidistant 25 miles from San Francisco and San Jose. 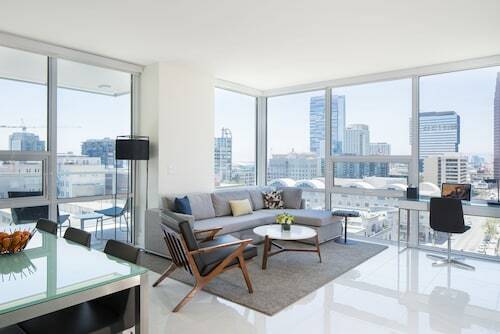 The Asian-inspired Hotel Nikko San Francisco is located downtown, a 4-minute walk from Union Square and the designer shops of Westfield San Francisco Centre. Guests can catch a cable car 2 blocks south, and both Curran Theatre and American Conservatory Theater are right around the corner. 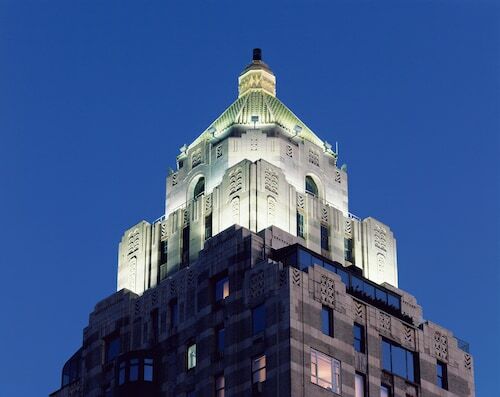 Located in Midtown, this luxury hotel is steps from Carnegie Hall and Broadway Theatre. Central Park and Gershwin Theater are also within 10 minutes. 7 Av. Station (E 53rd St.) and 50 St. Station (Broadway) are within a 5-minute walk. 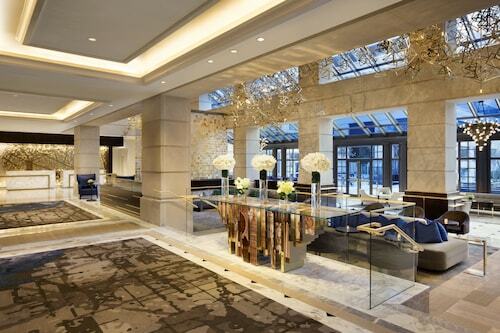 Located in Midtown, this luxury hotel is within a 5-minute walk of 5th Avenue and Madison Square Garden. 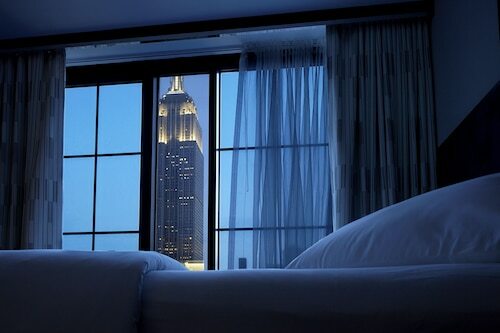 Empire State Building and Macy's are also within 15 minutes. 28 St. Station (Park Av. S) is only a 2-minute walk and 33 St. Station (Park Av. S) is 4 minutes. 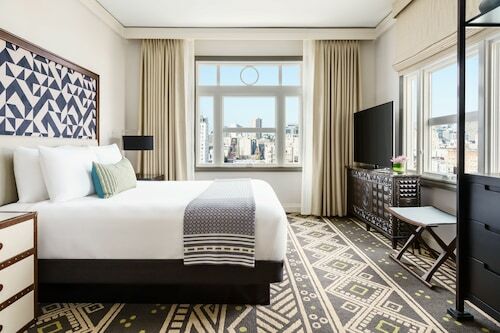 Situated on the waterfront, this luxury hotel is within 6 mi (10 km) of Chrysler Building, Empire State Building, and United Nations Headquarters. New York University and Washington Square Park are also within 6 mi (10 km). Nassau Av. Station is 8 minutes by foot and Bedford Av. Station is 9 minutes. 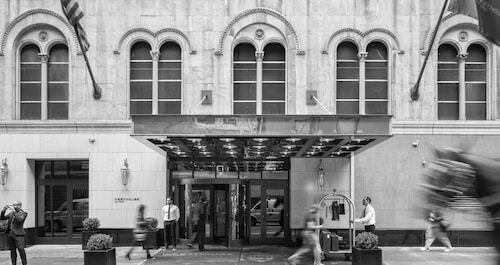 Located in Midtown, this luxury hotel is within a 10-minute walk of Carnegie Hall, Museum of Modern Art, and Columbus Circle. Times Square is 0.9 mi (1.5 km) away. 57 St. Station and 5 Av.-53 St. Station are within a 5-minute walk. Located in Midtown, this luxury hotel is steps from Times Square, New Amsterdam Theater, and Madame Tussauds Wax Museum. Broadway and Minskoff Theater are also within 5 minutes. Times Sq. - 42 St. Station is only a 2-minute walk and 42 St. - Port Authority Bus Terminal Station is 4 minutes. The boutiques and hip restaurants of Madison Avenue are just steps from The Surrey, which places guests on Manhattan's vibrant Upper East Side. 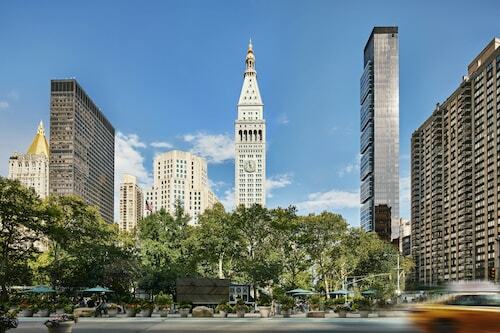 Both Central Park and the Whitney Museum of American Art are within 1 block of the hotel. 77 St. Subway Station is 2 blocks away. 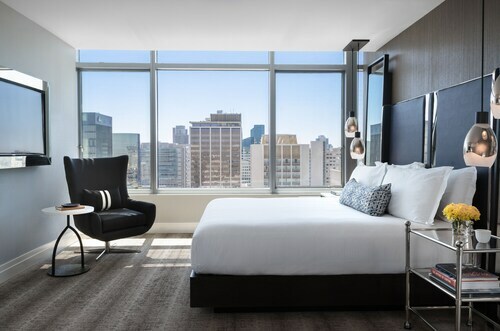 This family-friendly New York hotel is located in the entertainment district, just steps from St. Patrick's Cathedral and 5th Avenue. Rockefeller Center and Top of the Rock are also within 5 minutes. 51 St. Station is 6 minutes by foot and 47 - 50 Sts - Rockefeller Center Station is 8 minutes. 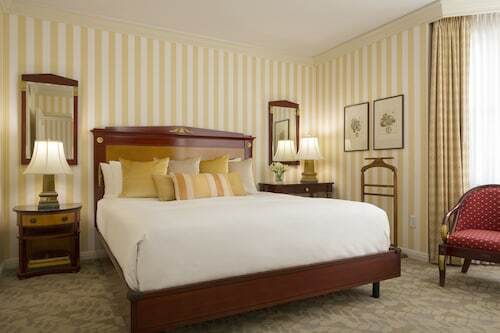 Located in Midtown, this luxury hotel is within a 5-minute walk of Carnegie Hall and Central Park. 5th Avenue and Broadway Theatre are also within 10 minutes. 5 Av.-53 St. Station is only a 5-minute walk and 57 St. Station is 5 minutes. 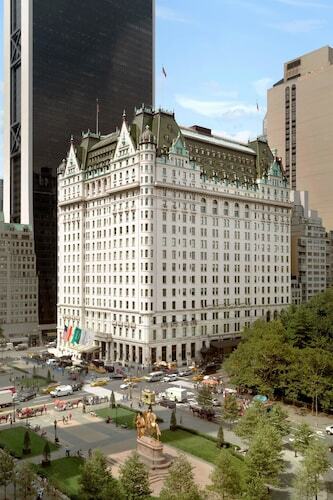 Built by newspaper magnate William Randolph Hearst in 1926, this Midtown hotel is across from the Museum of Modern Art (MoMA), 2 blocks from Broadway theaters, and 4 blocks from Rockefeller Center. 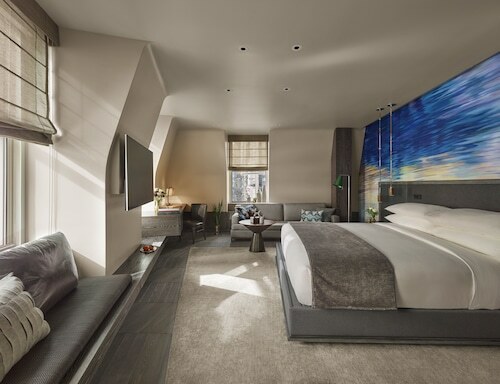 Set 1 block east of Fifth Avenue shopping, The Redbury New York offers residential ambience in Manhattan's Fashion and Design District, 4 blocks east of Madison Square Garden/Penn Station and also 4 blocks from the Empire State Building. 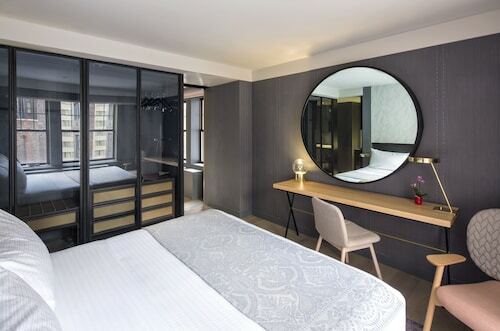 Located in Lower East Side, this luxury hotel is within 2 mi (3 km) of New York University, 5th Avenue, and Washington Square Park. Union Square and Bleecker Street are also within 1 mi (2 km). 2 Av. 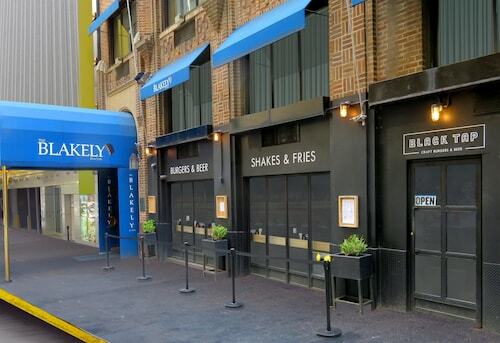 Station is 5 minutes by foot and Delancey St. Station is 6 minutes. 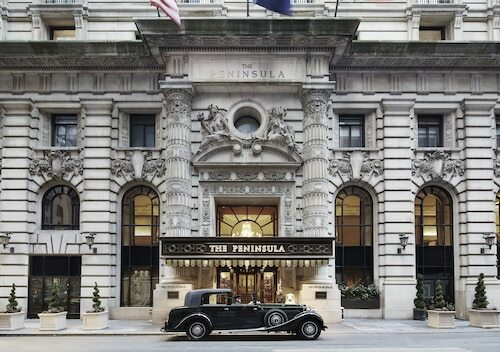 Located in Midtown, this luxury hotel is within a 10-minute walk of 5th Avenue, St. Patrick's Cathedral, and Rockefeller Center. Grand Central Terminal and Top of the Rock are also within 10 minutes. 5 Av Station (W. 42nd St.) is 5 minutes by foot and 47 - 50 Sts - Rockefeller Center Station is 7 minutes. 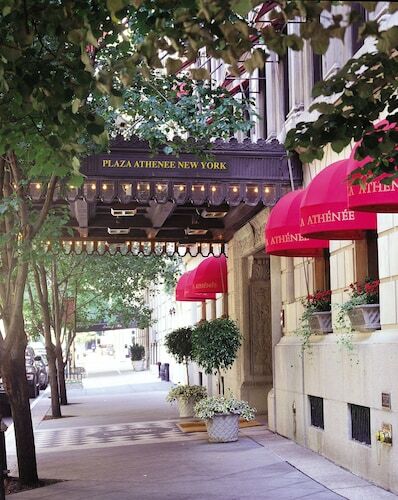 Located in Midtown, this luxury hotel is steps from Eugene O'Neill Theatre and Gershwin Theater. Broadway Theatre and Broadway are also within 5 minutes. 49th St. Station is only a 4-minute walk and 50 St. Station (Broadway) is 6 minutes. 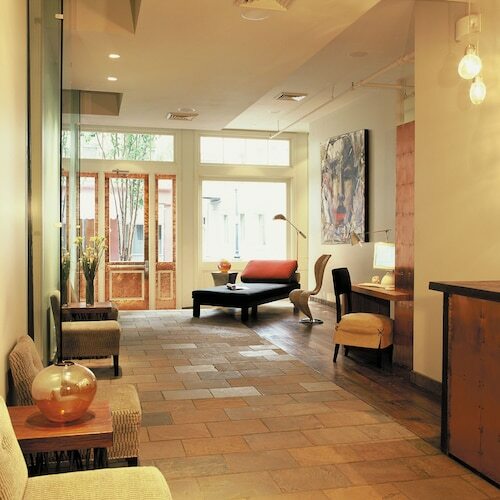 Overlooking the Park Avenue at the corner of East 38th Street, this Japanese-owned hotel four blocks south of Grand Central Terminal provides a hushed atmosphere graced by original artworks. 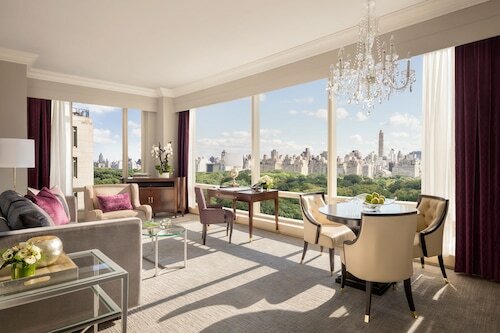 Situated in New York's Central Park neighborhood, this hotel is close to Barney's, Rockefeller Center, and Museum of Modern Art. Area attractions also include Carnegie Hall and St. Patrick's Cathedral. 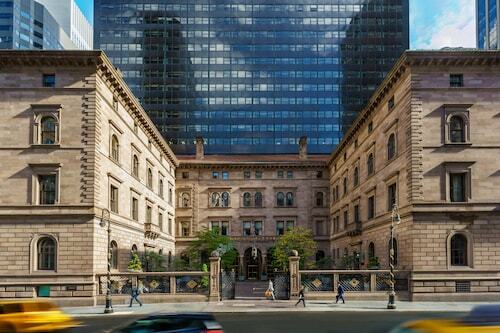 Located in Midtown, this luxury hotel is within a 10-minute walk of Carnegie Hall, 5th Avenue, and Broadway Theatre. 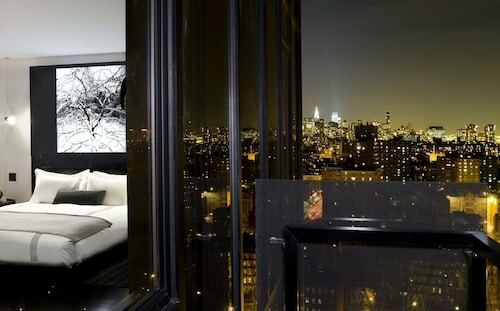 Central Park and Museum of Modern Art are also within 10 minutes. 7 Av. Station (E 53rd St.) and 5 Av.-53 St. Station are within a 5-minute walk. 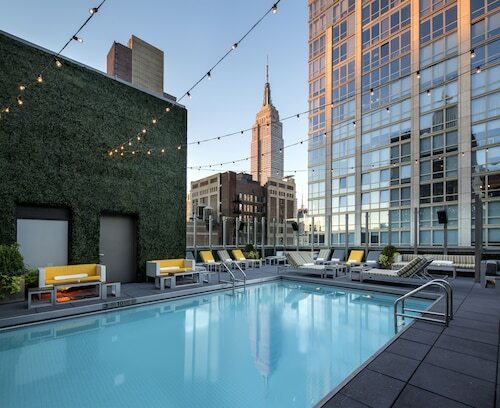 Located on Midtown New York's fashionable East Side, this stylish independent hotel is close to Grand Central Station, less than 2 blocks from the renowned shops on Fifth and Madison avenues, and 4 blocks from Rockefeller Center. 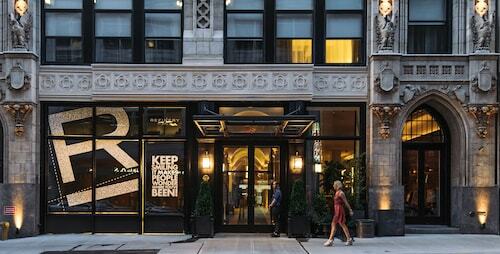 Located in Midtown, this luxury hotel is steps from Bryant Park and 5th Avenue. Macy's and Madison Square Garden are also within 5 minutes. 42 St. - Bryant Pk. Station is only a 4-minute walk and 34 St. Station (Herald Square) is 5 minutes. 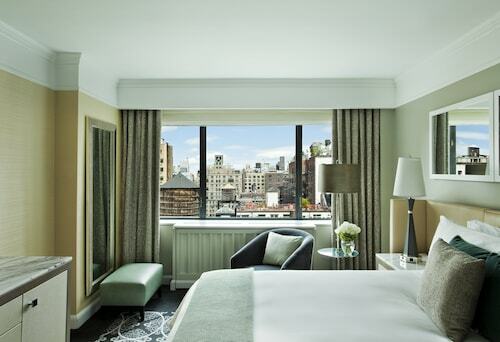 Located in Midtown, this luxury hotel is within a 5-minute walk of Broadway, 5th Avenue, and Minskoff Theater. Radio City Music Hall and Top of the Rock are also within 10 minutes. 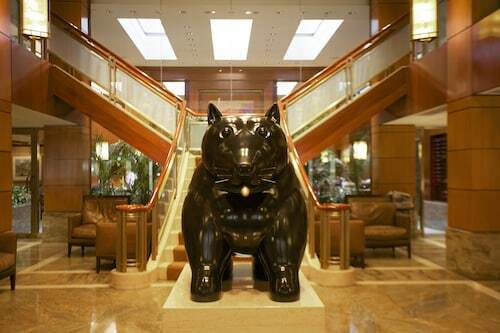 49th St. Station is only a 2-minute walk and 47 - 50 Sts - Rockefeller Center Station is 3 minutes. Located in Central Business District, this hotel is steps from Joy Theater, Canal Street, and Saenger Theatre. Bourbon Street and Royal Street are also within 10 minutes. New Orleans Union Passenger Terminal is 19 minutes by foot. Located in Central Business District, this hotel is within a 15-minute walk of Louisiana Children's Museum, National World War II Museum, and Louisiana State Museum. Audubon Zoo and Naval Air Station Joint Reserve Base New Orleans are also within 16 mi (25 km). New Orleans Union Passenger Terminal is 19 minutes by foot. Located in Uptown Historic District, this apartment building is within 1 mi (2 km) of Prytania Theatre, Magazine Street, and Lafayette Cemetery. Audubon Zoo and Tulane University are also within 3 mi (5 km). This hotel is in New Orleans in the French Quarter, a block from Bourbon Street. 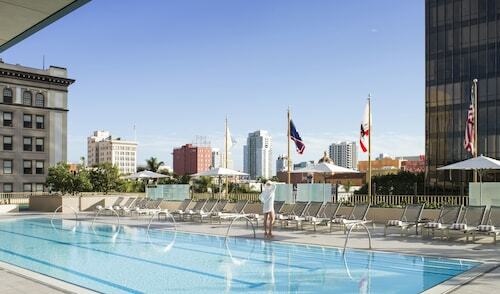 The hotel is in close proximity to the National World War II museum, Convention Center, and cruise ship terminals. International House Hotel is a nonsmoking, boutique-style hotel located within 2 blocks of the St Charles Ave Streetcar Line and French Quarter and 5 blocks from the convention center. The hotel is conveniently located in near the French Quarter. 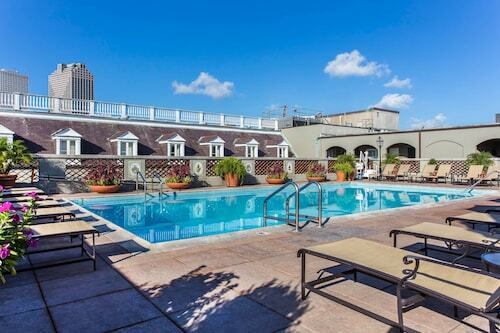 The hotel is within walking distance to of some of New Orleans most popular attractions. 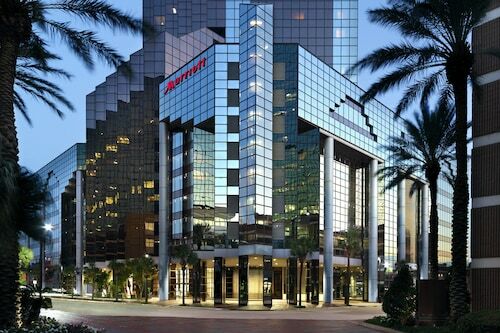 Located in Central Business District, this hotel is within a 10-minute walk of Lafayette Square, Smoothie King Center, and Mercedes-Benz Superdome. Contemporary Arts Center and Bourbon Street are also within 15 minutes. New Orleans Union Passenger Terminal is 7 minutes by foot. 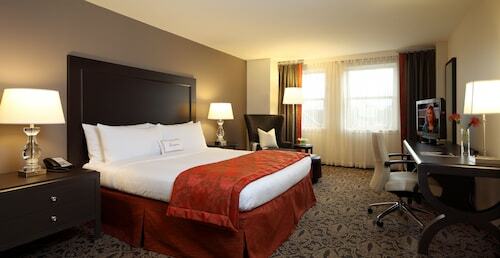 Located in Central Business District, this hotel is within a 5-minute walk of Canal Street and Saenger Theatre. Bourbon Street and Mercedes-Benz Superdome are also within 15 minutes. New Orleans Union Passenger Terminal is 21 minutes by foot. 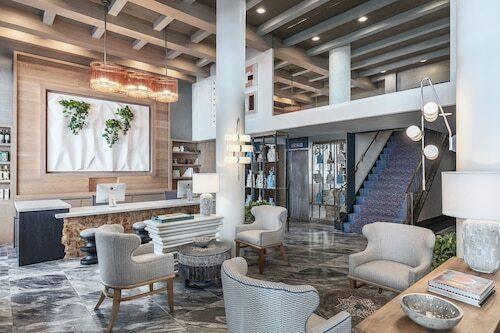 This New Orleans hotel has undergone a complete renovation and reopened in April, 2018. The hotel is 3 blocks from Bourbon St and the French Quarter, and 4 blocks from the Aquarium of the Americas and the Riverwalk Marketplace. 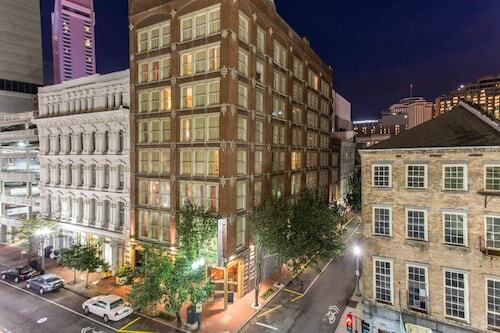 This 21-story New Orleans hotel is 1 mile from Jackson Square. The French Quarter, Riverwalk Marketplace, New Orleans Morial Convention Center, and Aquarium of the Americas are 3 blocks away. The restaurants, shops, and live entertainment along historic Bourbon St are just steps away from the restored 1913 facade of this centrally located New Orleans French Quarter hotel. 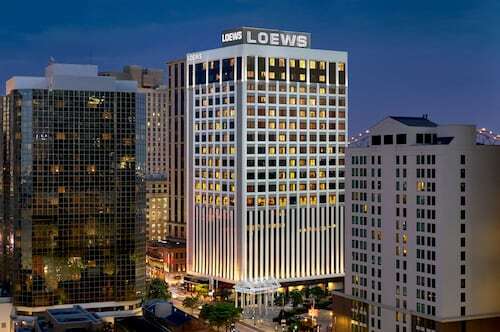 Overlooking the Mississippi River, this 29-story New Orleans hotel is adjacent to Harrah's New Orleans Casino and the lively French Quarter, and within 0.5 mile of artsy Jackson Square and the French Market. 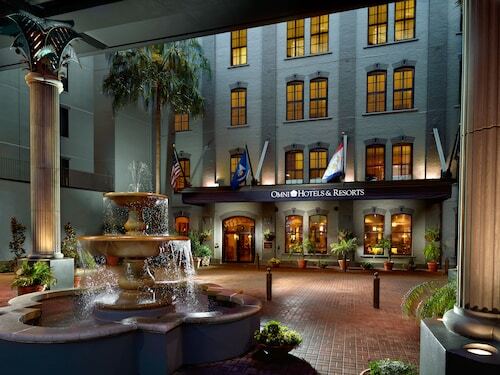 Located in the New Orleans Central Business District, this hotel is across the street from Ernest N Morial Convention Center, Riverwalk Outlet Collection, and the Mississippi River. The French Quarter is a 5-block stroll away. Situated in the historical district, this hotel is within a 5-minute walk of Frenchmen Street Jazz Clubs and Bourbon Street. French Market and Cafe Du Monde are also within 10 minutes. The Whitney Hotel is located in the Central Business District, close to Bourbon St, and Jackson Square, and the streetcar stops outside. The French Quarter, Mercedes-Benz Superdome, and Harrah's Casino are nearby and Starbuck's is conveniently located close to the property. Located 1 block from the nightlife and restaurants of Bourbon St, the Dauphine Orleans Hotel is 2 blocks from the antique stores on Royal St., Canal St. and 1 mile from Outlet Collection at Riverwalk. 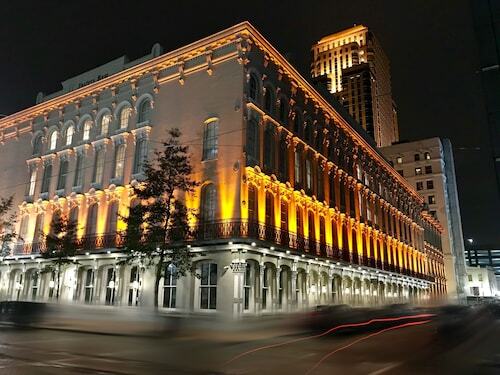 This New Orleans hotel is a block from the French Quarter and the Saenger Theatre, 3 blocks from Bourbon Street, and one-half mile from Lafayette Square. The Louisiana Superdome is within a mile. 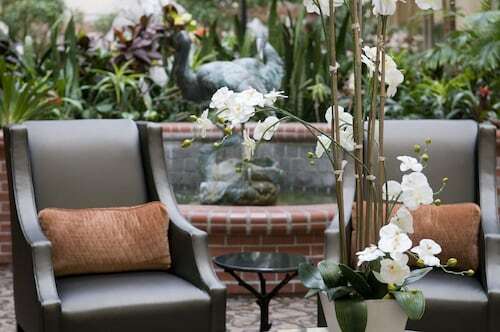 Located in French Quarter, this hotel is within a 10-minute walk of Bourbon Street and Jackson Square. French Market and National World War II Museum are also within 15 minutes. New Orleans Union Passenger Terminal is 23 minutes by foot. 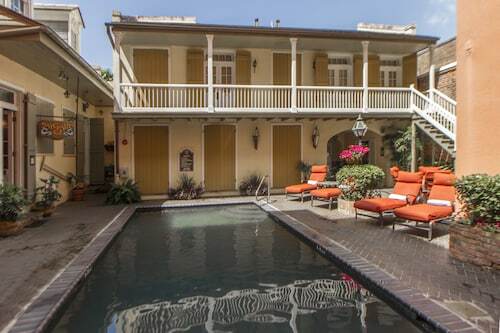 Located in Lower Garden District, this hotel is within a 15-minute walk of Magazine Street and Lafayette Cemetery. National World War II Museum and Ernest N. Morial Convention Center are also within 1 mi (2 km). New Orleans Union Passenger Terminal is 22 minutes by foot. Located in Central Business District, this apartment building is within a 10-minute walk of Canal Street, Bourbon Street, and Lafayette Square. Royal Street and Decatur Street are also within 10 minutes. New Orleans Union Passenger Terminal is 14 minutes by foot. Situated on a river, this hotel is 3.1 mi (4.9 km) from Audubon Zoo and within 6 mi (10 km) of Lakeside Shopping Center and New Orleans Museum of Art. Mercedes-Benz Superdome and Ernest N. Morial Convention Center are also within 9 mi (15 km). 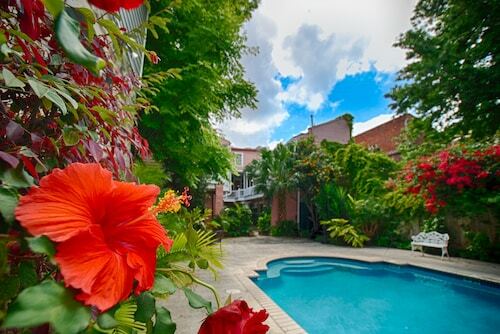 Situated in New Orleans, this apartment building is within 2 mi (3 km) of Xavier University of New Orleans, Tulane University, and Loyola University New Orleans. Audubon Zoo and Magazine Street are also within 3 mi (5 km). 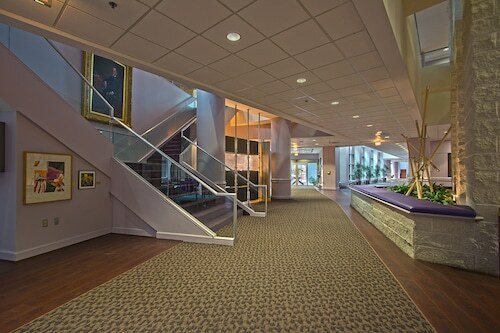 Situated in Metairie, this hotel is within 1 mi (2 km) of Metairie Business District and Lakeside Shopping Center. East Jefferson General Hospital and Clearview Mall are also within 3 mi (5 km). Located in Central Business District, this hotel is within a 10-minute walk of Canal Street, Bourbon Street, and Saenger Theatre. Mercedes-Benz Superdome and Smoothie King Center are also within 15 minutes. New Orleans Union Passenger Terminal is 12 minutes by foot. 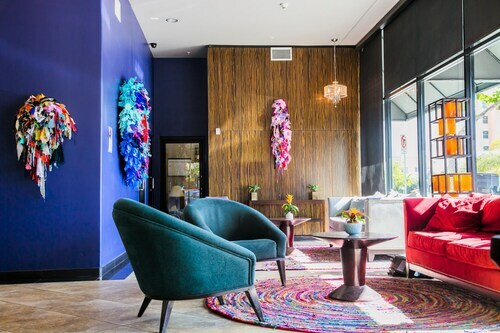 This ultramodern New Orleans hotel, offering Soho-style lofts, and lies 2 blocks from the French Quarter, 5 blocks from Ernest N Morial Convention Center, and 9 blocks from artsy Jackson Square. 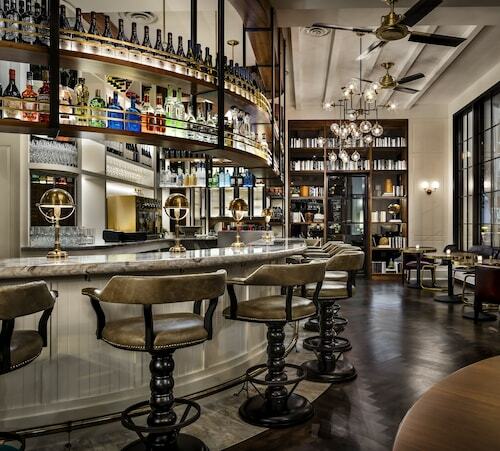 Italy's Cipriani family, renowned for Harry's Bar in Venice and restaurants around the world, has created Mr. C Beverly Hills, a stylish new luxury hotel a half-mile from Rodeo Drive. The Grove shopping destination is 3.5 miles away. Santa Monica is 7 miles west. 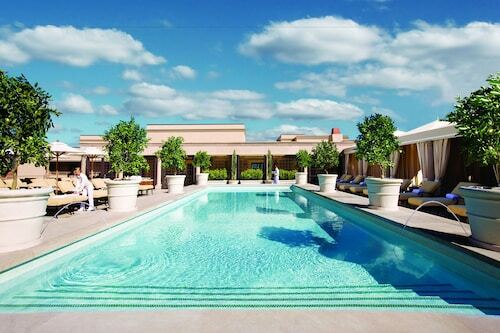 An oasis just north of downtown Los Angeles, The Langham Huntington is surrounded by luxurious shopping and fine dining options, The Rose Bowl and the world-famous Huntington Library and Gardens. 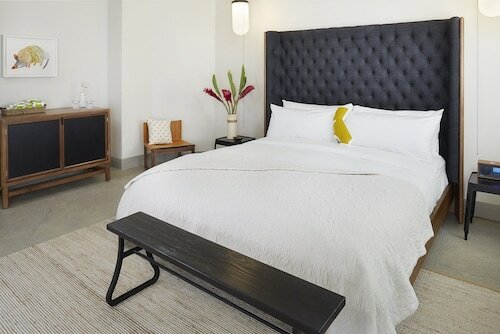 This award-winning boutique hotel in Santa Monica is 1 block from the beach, 1 mile from the Third Street Promenade, and 10 miles from Los Angeles International Airport. 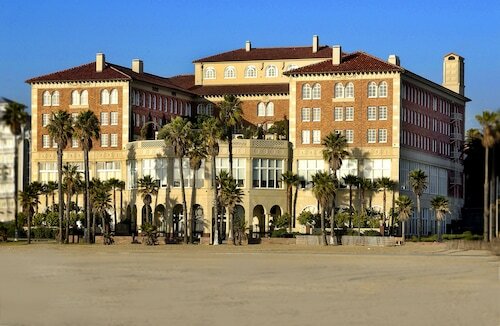 This 1921 Los Angeles-area hotel is perched above Santa Monica Beach, and sits at the end of Wilshire Boulevard, across from Palisades Park. Third Street Promenade is 3 blocks away. Located in the heart of Beverly Hills, this luxury hotel is within 1 mi (2 km) of Museum of Tolerance, Rodeo Drive, and Melrose Avenue. Sunset Strip and Wilshire Boulevard are also within 2 mi (3 km). 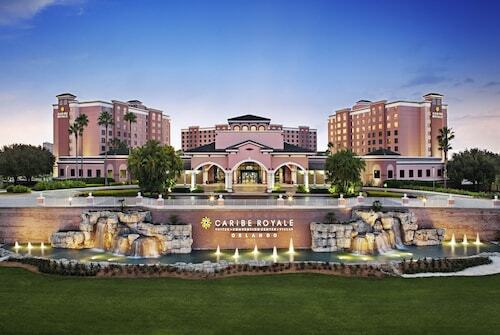 Situated in Bell Gardens, this luxury hotel is 0.2 mi (0.3 km) from The Bicycle Casino and within 9 mi (15 km) of Citadel Outlets and California State University-Los Angeles. Fashion District and Presbyterian Intercommunity Hospital are also within 9 mi (15 km). 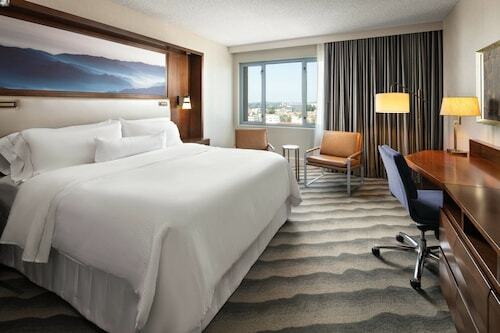 Situated in the business district, this luxury hotel is 0.7 mi (1.1 km) from Citadel Outlets and within 9 mi (15 km) of Walt Disney Concert Hall and Los Angeles Convention Center. Microsoft Theater and L.A. Live are also within 9 mi (15 km). Commerce Station is 27 minutes by foot. 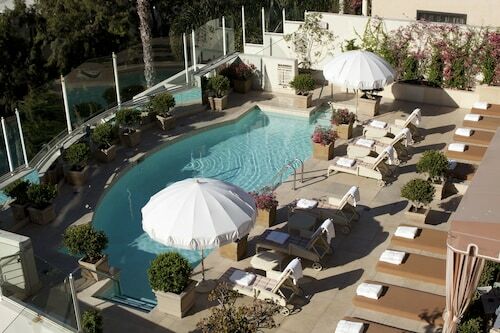 Located in the heart of Beverly Hills, this luxury hotel is within a 15-minute walk of Rodeo Drive and Wilshire Boulevard. Melrose Avenue and Cedars-Sinai Medical Center are also within 2 mi (3 km). 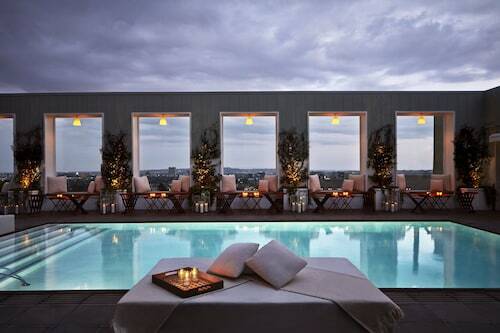 Located in Downtown Los Angeles, this luxury hotel is within a 5-minute walk of Grammy Museum and Staples Center. Fashion District and Los Angeles Convention Center are also within 1 mi (2 km). 7th Street - Metro Center Station is 10 minutes by foot and Pershing Square Station is 22 minutes. 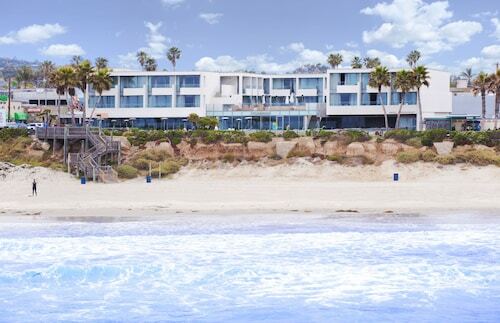 Located by the ocean, this family-friendly hotel is within 12 mi (20 km) of Point Dume State Beach and Preserve, Westlake Village Golf Course, and Pepperdine University. Malibu Pier and Getty Villa are also within 25 mi (40 km). Located steps from the Pacific Ocean and walking distance to Santa Monica’s premier attractions, including the iconic Santa Monica Pier, the original Muscle Beach, 3rd Street Promenade, and a variety of entertainment and outdoor recreation. 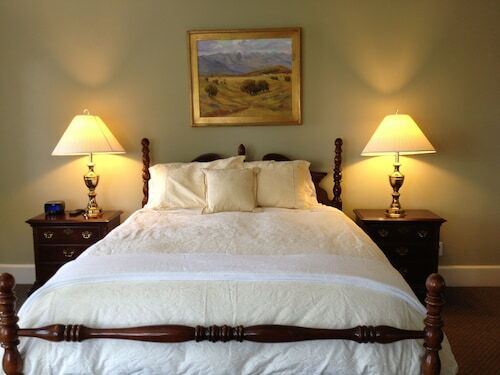 Situated in South Pasadena, this bed & breakfast is 3.1 mi (5 km) from Occidental College and within 6 mi (10 km) of Rose Bowl Stadium and Huntington Library. California Institute of Technology and Dodger Stadium are also within 9 mi (15 km). 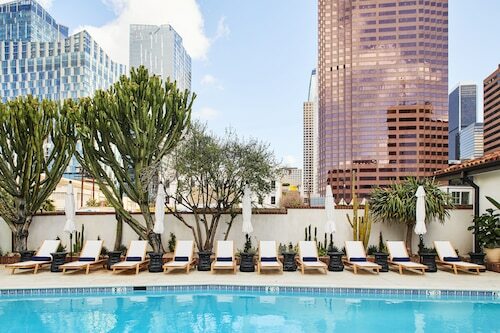 Located in the financial district of downtown, this hotel is within blocks of the Staples Center, Nokia Theater, Museum of Contemporary Art, and Walt Disney Concert Hall. Dodger Stadium is 3 miles (5 kilometers) away. 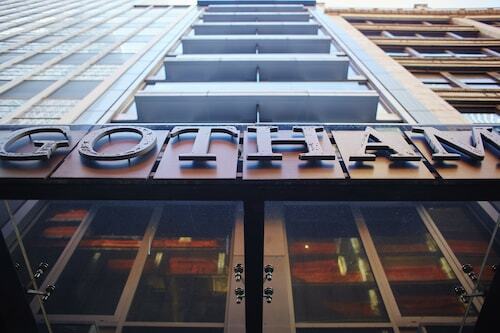 Located in Historic Core, this boutique hotel is within a 5-minute walk of Orpheum Theatre and Fashion District. Staples Center and Pershing Square are also within 15 minutes. Pershing Square Station is 12 minutes by foot and 7th Street - Metro Center Station is 15 minutes. 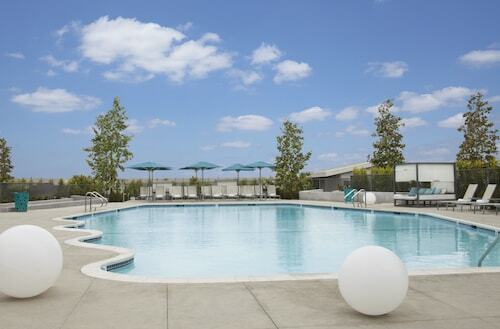 Just off I-405, this Hawthorne, CA hotel is 3 miles from the Manhattan Beach oceanfront and 3.5 miles from Los Angeles International Airport (LAX). Downtown LA is about 14 miles away. 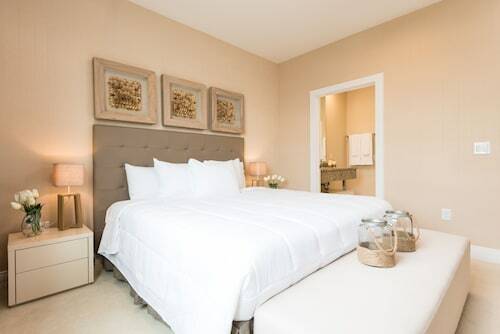 Poised on a quiet residential street just steps away from shopping, dining, and nightlife, this boutique hotel is 1 block from Sunset Strip, within 2 miles of Beverly Hills, and 4 miles from Hollywood. Just 6 blocks from historic Old Pasadena and a short drive from downtown Los Angeles, this 4-star Westin hotel borders Plaza Las Fuentes, with its fountains, shops, and cafés. More shops and restaurants are 2 blocks away at Paseo Colorado. The Grafton on Sunset is ideally located in the heart of West Hollywood near shopping at Sunset Plaza and Rodeo Drive, renowned cuisine at iconic dining venues, and popular nightclubs. Located near Universal Studios Theme Park, Universal CityWalk, and CBS Studio Center, this Art Deco hotel in North Hollywood is also close to the Hollywood sign. Situated in Universal City, this hotel is within a 15-minute walk of Universal Studios Hollywood™ and The Wizarding World of Harry Potter. Universal CityWalk and Warner Brothers Studio are also within 3 mi (5 km). Universal City Station is 5 minutes by foot. 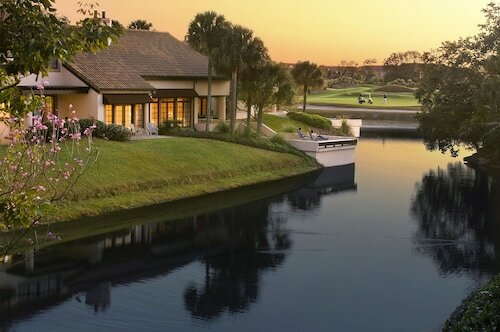 Reunion Resort & Golf Club is a 13-minute drive from Walt Disney World Resort, and 20 minutes from SeaWorld® Orlando and Universal Orlando Resort. Gatorland and the Kennedy Space Center are 25 minutes and an hour by car respectively. 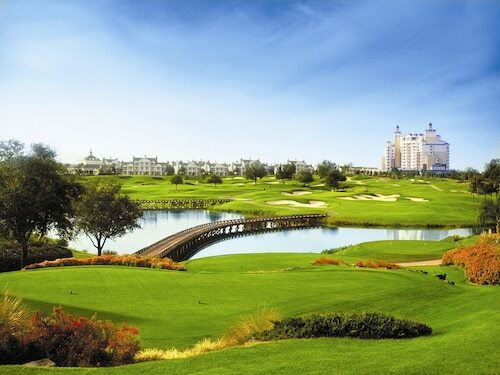 Omni Orlando Resort at ChampionsGate makes a perfect base for golfers and theme park addicts. It’s a 15-minute free shuttle ride from Walt Disney World Resort, and 20 minutes by car from Universal Orlando Resort® and SeaWorld®. This 1,500 acre family friendly resort features spacious suites and 1 - 4 bedroom villas. 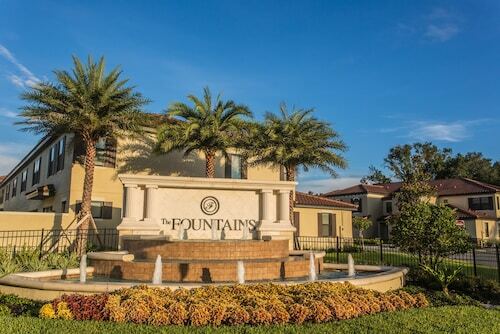 The property offers a great range of amenities, including 2 pools, 3 restaurants, complimentary scheduled transportation to the theme parks and the outlet mall as well as 45 holes of Jack Nicklaus signature design golf. Situated in Kissimmee, this vacation home is 1.4 mi (2.3 km) from ChampionsGate Golf Club and within 20 mi (32 km) of Orlando Vineland Premium Outlets and SeaWorld® Orlando. Walt Disney World® and Universal Studios Florida™ are also within 20 mi (32 km). 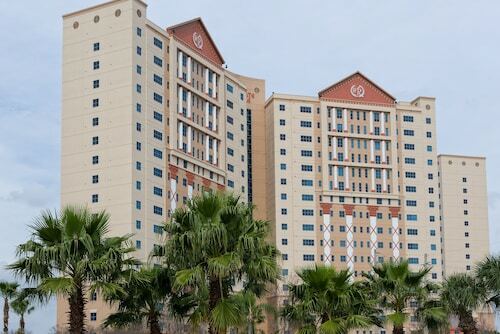 Situated in Orlando, this condo resort is 1.8 mi (2.9 km) from Lake Buena Vista Factory Stores and within 6 mi (10 km) of Disney Springs® and Disney's Hollywood Studios®. Discovery Cove and Disney's Animal Kingdom® Theme Park are also within 9 mi (15 km). 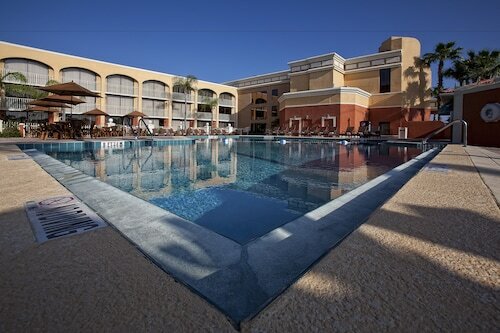 Situated in Orlando, this condo resort is 0.3 mi (0.5 km) from Lake Buena Vista Factory Stores and within 6 mi (10 km) of Orlando Vineland Premium Outlets and Disney Springs®. ESPN Wide World of Sports and Disney's Hollywood Studios® are also within 6 mi (10 km). This family-friendly Kissimmee condo resort is located in the entertainment district, within a 10-minute walk of Old Town and Fun Spot America. Museum of Military History and Celebration Golf Club are also within 3 mi (5 km). 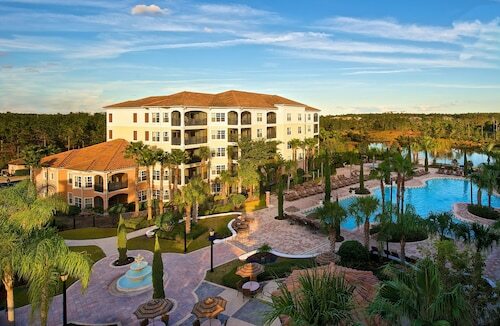 Located in Kissimmee, this family-friendly condo resort is 3.5 mi (5.6 km) from ChampionsGate Golf Club, and within 12 mi (20 km) of Celebration Golf Club and Disney Springs®. Walt Disney World® and Orlando Vineland Premium Outlets are also within 16 mi (25 km). 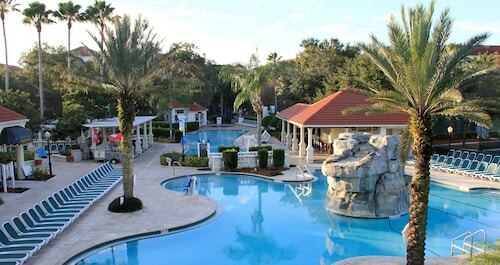 The Westgate Lakes Resort & Spa Universal Studios Area is perfect for families and closely located to Orlando's theme parks. SeaWorld® and Universal Studios Orlando® are a 5-minute drive, and Walt Disney World Resort is 10 minutes away. 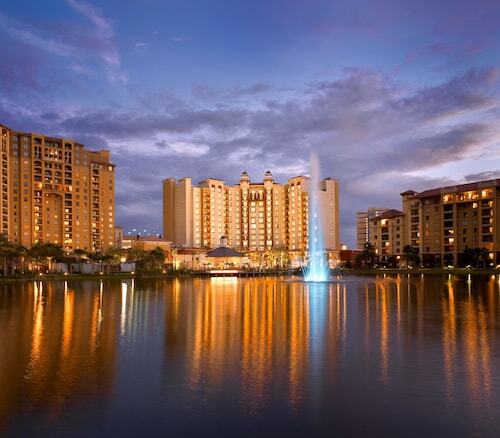 The hotel is also just minutes away from the Orlando Orange County Convention Center. 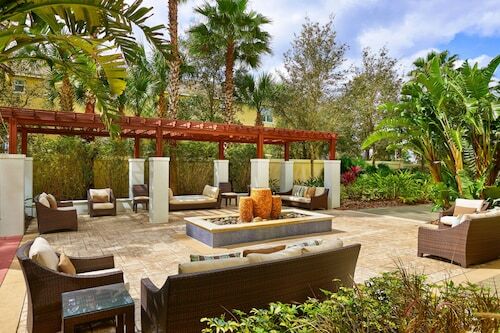 Situated in Orlando, this spa resort is within 3 mi (5 km) of Arnold Palmer's Bay Hill Golf Club, Universal Orlando Resort™, and Universal Studios Florida™. Lake Butler is 1.5 mi (2.4 km) away. 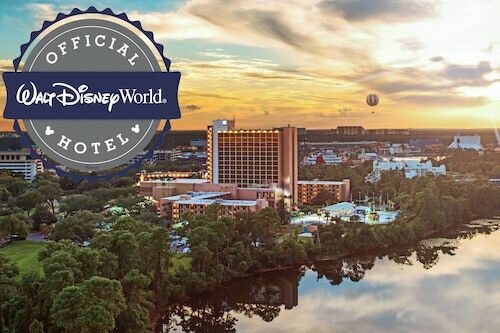 Located in the entertainment district, this family-friendly resort is within 6 mi (10 km) of Disney Springs®, Disney's Hollywood Studios®, and Epcot®. SeaWorld® Orlando and Walt Disney World® are also within 9 mi (15 km). 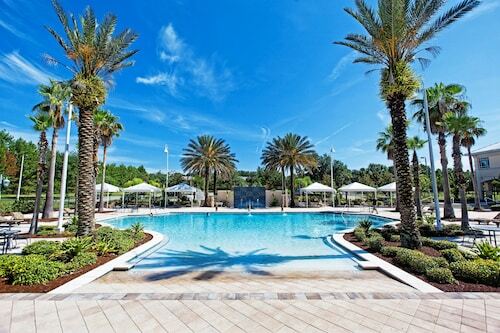 This Orlando resort sits on 1,500 lushly landscaped acres, minutes from all of Orlando's theme parks and shopping including 1 mile from Walt Disney World Resort and 5 miles from Sea World®. Situated in the entertainment district, this hotel is within 3 mi (5 km) of Timacuan Golf Club, Seminole Towne Center, and Mayfair Country Club. The Legacy at Alaqua Lakes and Sylvan Lake Park are also within 6 mi (10 km). 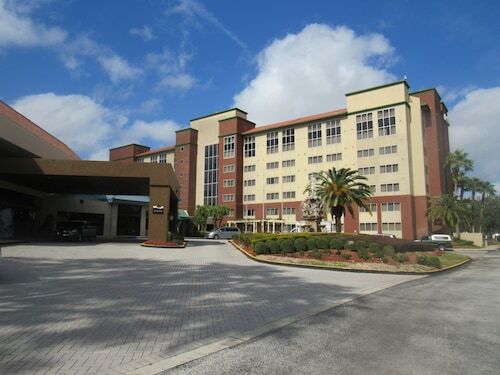 Located in walking distance to I-Drive and Universal Blvd. Universal Studios is less than 1 mile and the Convention Center and Prime Outlets are within 2 miles. Free shuttle service & I-Ride Trolley stop. 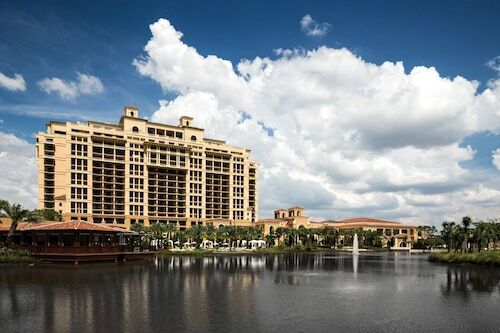 An elevator ride away from the airport's shops, restaurants, and day spa, this hotel is within 21 miles of Walt Disney World, SeaWorld, and Universal Studios Orlando. 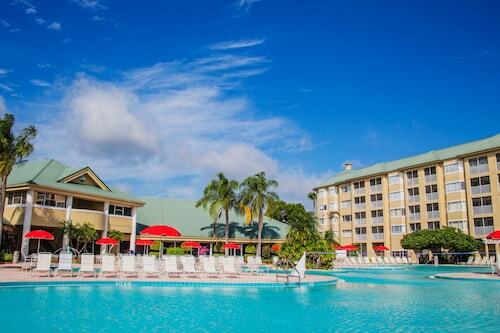 Situated in the entertainment district, this condo resort is 2.5 mi (4 km) from Disney's Animal Kingdom® Theme Park and within 6 mi (10 km) of ESPN Wide World of Sports and Old Town. Disney's Hollywood Studios® and Disney's Blizzard Beach Water Park are also within 6 mi (10 km). This Orlando hotel is 1.5 miles from Orlando Premium Outlets and 2.5 miles from SeaWorld Adventure Park, including Discovery Cove and Aquatica. Orange County Convention Center is 3.25 miles away. This family-friendly Kissimmee hotel is located on a lake, within 2 mi (3 km) of Lake Buena Vista Factory Stores, Fun Spot America, and Capone's Dinner Show. Old Town is 2.1 mi (3.4 km) away. This family-friendly Orlando hotel is located in the entertainment district, within a 5-minute walk of ICON Orlando, Madame Tussauds, and SEA LIFE Orlando Aquarium. Pointe Orlando and Ripley's Believe It or Not are also within 1 mi (2 km). 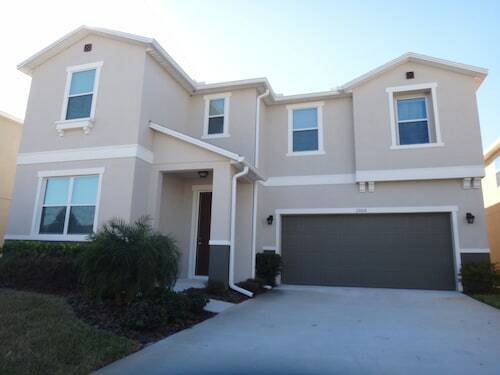 Situated in Kissimmee, this vacation home is 1 mi (1.7 km) from Lake Buena Vista Factory Stores and 2.7 mi (4.4 km) from Old Town. Capone's Dinner Show and Fun Spot America are also within 3 mi (5 km). 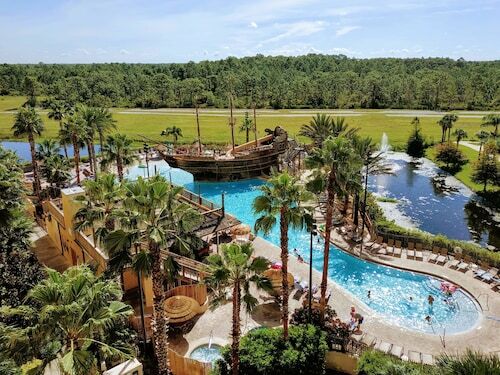 This family-friendly hotel is 2 miles from Disney's Animal Kingdom Theme Park, 4 miles from Epcot, 11 miles from SeaWorld and Discovery Cove, and 15 miles from Universal Orlando. 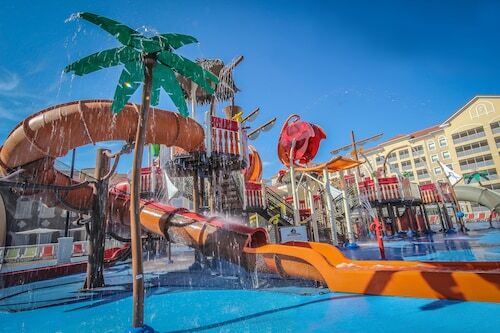 This family-friendly Kissimmee resort is located in the entertainment district, 2.6 mi (4.1 km) from Disney's Animal Kingdom® Theme Park, and within 6 mi (10 km) of Disney's Hollywood Studios® and Disney's Blizzard Beach Water Park. Fun Spot America and Old Town are also within 6 mi (10 km). 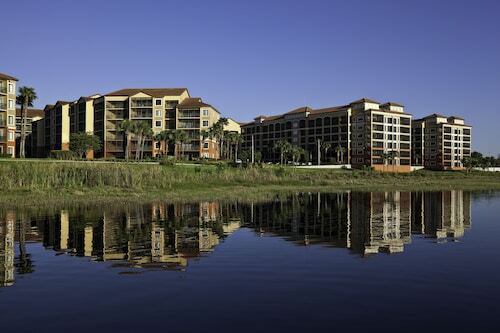 This family-friendly Kissimmee condo resort is located on a lake, 3 mi (4.8 km) from Falcon's Fire Golf Club, and within 9 mi (15 km) of Orlando Vineland Premium Outlets and Disney Springs®. 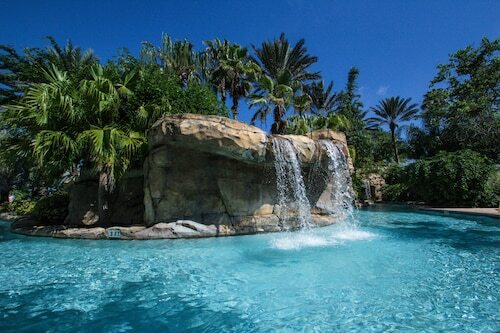 Aquatica and SeaWorld® Orlando are also within 9 mi (15 km). Located near the beach, this family-friendly hotel is within 6 mi (10 km) of San Diego Polo Fields, Torrey Pines State Beach, and Torrey Pines State Reserve. Birch Aquarium and Del Mar Beach are also within 9 mi (15 km). This downtown hotel is within 2 blocks of Horton Plaza shopping center and trendy restaurants and nightclubs in the Gaslamp Quarter. The San Diego Convention Center is 8 blocks away. 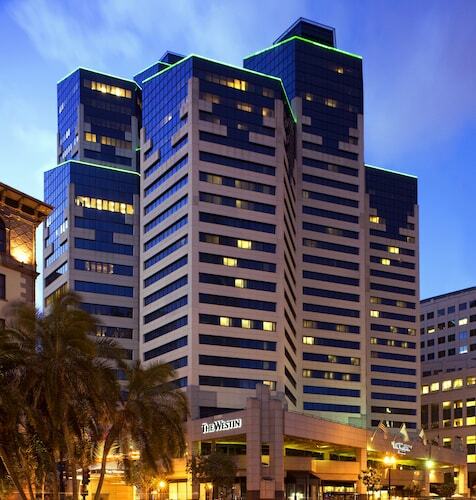 Located in Downtown San Diego, this luxury hotel is within a 10-minute walk of Copley Symphony Hall and Westfield Horton Plaza. Balboa Park and Petco Park are also within 15 minutes. 5th Avenue Station is only a 2-minute walk and Civic Center Station is 3 minutes. 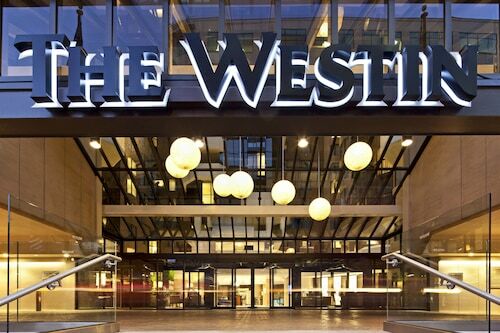 The striking, 26-story Westin San Diego is 1 block from the trolley station, 3 blocks from Horton Plaza shopping, and 5 blocks from San Diego's historic Gaslamp Quarter. 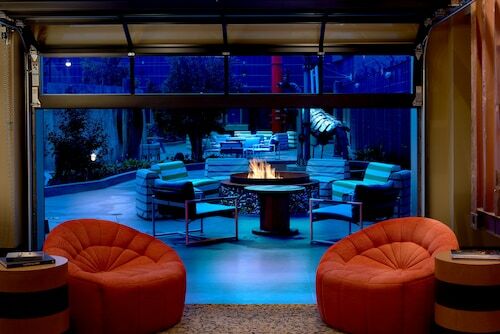 Located in Gaslamp Quarter, this spa hotel is within a 10-minute walk of Lyceum Theatre and Westfield Horton Plaza. Petco Park and San Diego Convention Center are also within 15 minutes. 5th Avenue Station is 6 minutes by foot and Civic Center Station is 7 minutes. 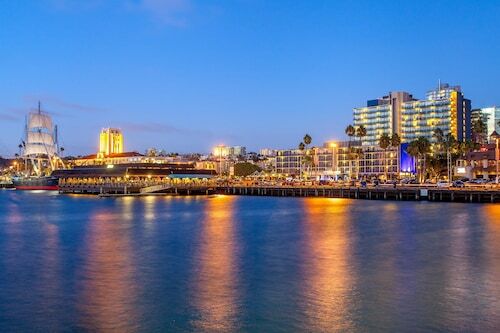 Omni San Diego Hotel places guests in the city’s vibrant Gaslamp Quarter, opposite San Diego Convention Center and connected to PETCO Park by a skybridge that is open for games during baseball season only. It’s a 10-minute drive north to the world-famous San Diego Zoo, and 15 minutes by car to the airport. 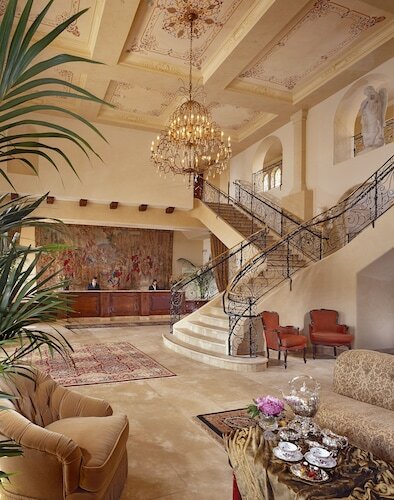 This 8-story hotel is 2 miles from historic Old Town San Diego and 6 miles from downtown. The San Diego Zoo is within 5 miles. 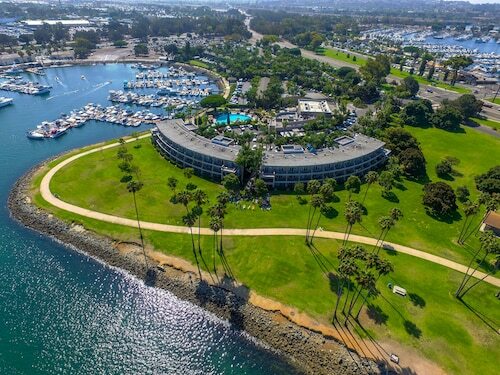 Situated at the tip of Shelter Island, this 8-acre resort is 6 miles (9.7 kilometers) from SeaWorld and Seaport Village; historic Old Town and downtown San Diego are 7 miles (11.3 kilometers) away. 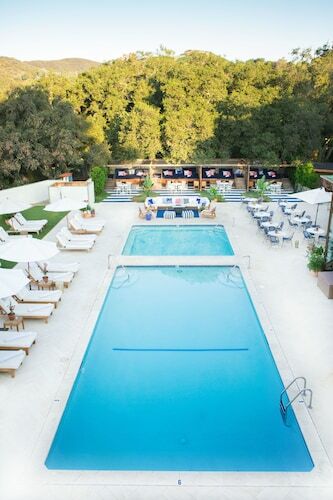 Located in San Diego, this hotel is 1 mile (1.6 kilometers) from Carmel Mountain Plaza and 1.7 miles (2.7 kilometers) from Black Mountain Open Space Park. Seaworld is 16.9 miles (27.2 kilometers) from the hotel, and San Diego Zoo Safari Park is 9.6 miles (15.4 kilometers) away. 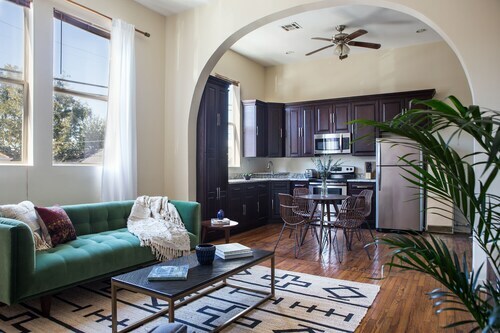 Located in Downtown San Diego, this apartment building is within 1 mi (2 km) of Chicano Park, Petco Park, and Balboa Park. San Diego Convention Center and San Diego City College are also within 1 mi (2 km). Park and Market Trolley Station is 7 minutes by foot and 12th and Imperial Transit Center Station is 8 minutes. 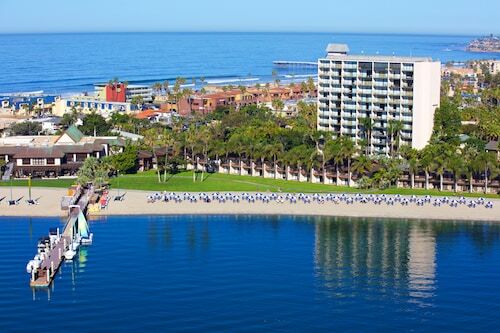 Facing the calm expanse of Mission Bay in north San Diego, and a 3-minute walk from the sands and famous boardwalk of Pacific Beach, family-friendly Catamaran Resort and Spa makes a great base for water lovers. SeaWorld® is 3 miles (4.8 km) away, and it's a 20-minute cab ride to downtown San Diego or San Diego Zoo. This 297-acre resort is 1 mile from the Bernardo Winery, within 5 miles of 2 shopping plazas, 10 miles from San Diego Wild Animal Park, and 26 miles from downtown San Diego. 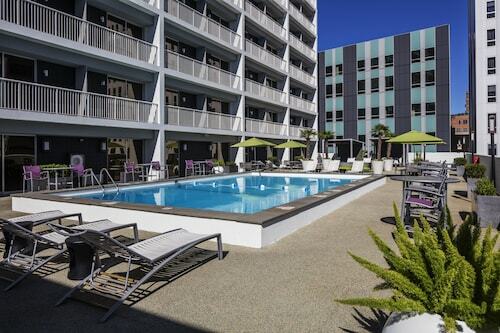 This three-story hotel is 2 miles from Belmont Park, 4 miles from SeaWorld and the Mission Bay Aquatic Park, and 11 miles from downtown San Diego and the San Diego Zoo. Just west of the downtown core, this San Diego hotel is across the street from the cruise ship terminal, Coronado ferry, and the Maritime Museum. The Gaslamp Quarter and Petco Park are within 1.5 miles. 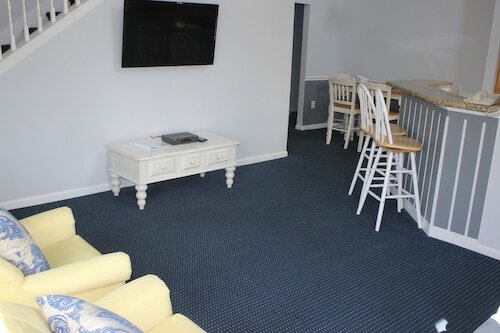 Situated near the boardwalk, this resort is within 1 mi (2 km) of Mission Beach Boardwalk, Mission Bay, and Belmont Park. SeaWorld and Mission Beach are also within 2 mi (3 km). 4 miles from Torrey Pines Golf Course and 8 miles from SeaWorld, this Michael Graves-designed hotel lies on 11 acres in the Golden Triangle high-tech/biotech area. 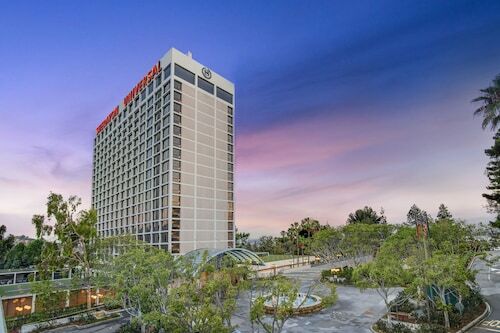 In the Mission Valley business and shopping corridor, less than 6 miles from downtown, this Marriott is across the street from a San Diego trolley line with access to many city sights. 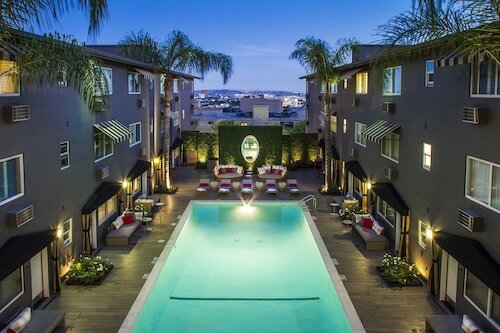 Centrally located in Gaslamp Quarter, close to Little Italy, Hillcrest, North Park, and Coronado Island communities. The San Diego Convention Center, PETCO Park, and Horton Plaza Mall are within walking distance of this San Diego boutique hotel. Surrounded by palm trees, this hotel is situated on 5 acres of land, 9 miles from La Jolla beaches, 8 miles from the San Diego Zoo, and about 5 miles from the Chargers' Qualcomm Stadium. Located in central Mission Valley off highway I-8, Handlery Hotel is a 10-minute drive from San Diego Airport. 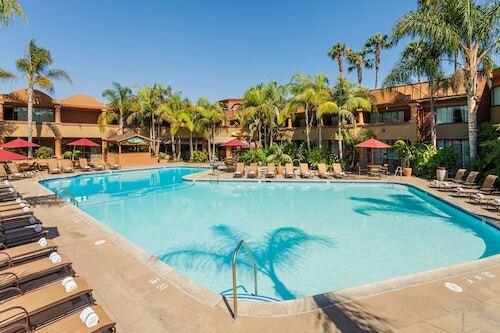 This convenient location means guests are also 10 minutes from San Diego's famed zoo and historic Old Town. SeaWorld® theme park is also a 10-minute drive away. 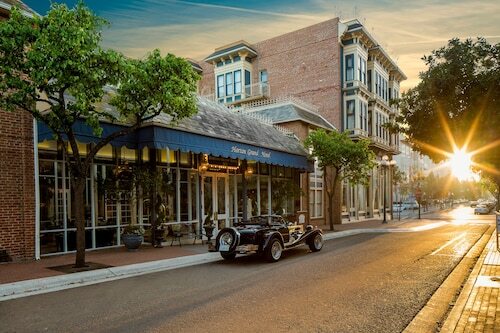 This traditional boutique hotel, across from shopping and dining at Horton Plaza, is 3 blocks from the historic Gaslamp Quarter and 6 blocks from the cruise ship terminal and the Convention Center. Located in University Heights, this hotel is within 3 mi (5 km) of Balboa Park, San Diego Zoo, and Hotel Circle. San Diego Air and Space Museum and San Diego City College are also within 3 mi (5 km). Comprising 32 acres, this resort and conference center is next to the 27-hole Riverwalk Golf Club; Old Town, Balboa Park, SeaWorld San Diego, and the world famous San Diego Zoo are just minutes away. 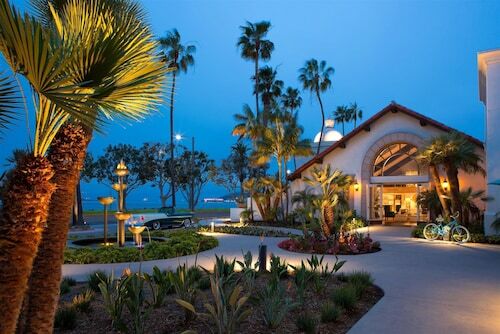 Adjacent to San Diego's Mission Bay, this 13-acre hotel is within 2 miles of SeaWorld and Mission Beach, and 6 miles of the San Diego Zoo.